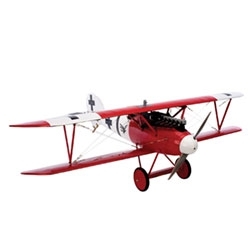 The E-flite® Albatros D.Va 25e is an accurate, electric-powered reproduction of the famed German fighter used during WWI with the Jasta 18 squadron. Constructed of laser-cut balsa, this red-nosed hunter includes the finer-point detail only available as a Platinum Series model and is sure to stand the test of time, just like its full-scale cousin. Even the most discerning modeler will appreciate the exceptional level of included detail. From the Lozenge camouflage covering on the bottom of the wings to the exposed cylinders of the Mercedes engine and the vented barrels of its Spandau machine gun, this battle-bird has an authentic look from any angle.